COCOA BEACH, Florida - Swimmers were temporarily ordered out of the water by Brevard County Ocean Rescue lifeguards along a stretch of beach in Cocoa Beach, Florida after sharks were spotted in the Atlantic Ocean near the Cocoa Beach Pier around 11 a.m. on Sunday, April 9, 2017. 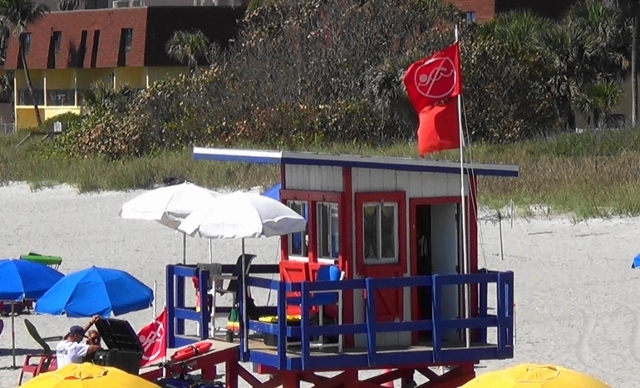 After lifeguards flew double red flags for about thirty minutes, beachgoers were once again allowed back into the water. There has been an increase in the number of shark sightings the last few days off of Florida's Space Coast just before Tuesday's Full Moon.